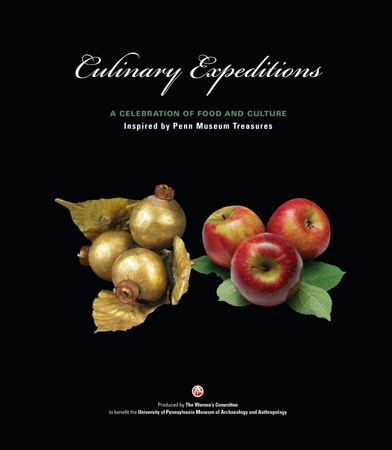 The 80 recipes in Culinary Expeditions: A Celebration of Food and Culture range from appetizers and soups to hearty main courses, sides and sauces. They come from eight cultural regions, all of which have objects housed in the Penn Museum: Africa, Asia, Egypt, Greece and Rome, Mesoamerica, the Middle East and Native America. The result of a two-year collaboration between the Museum’s staff and its Women’s Committee, the cookbook leads Penn Museum’s food-focused offerings this fall. Its café is rotating a selection of dishes from Culinary Expeditions through the end of this year, and visitors can grab a map that leads to 10 food-related objects in the galleries. There are a few special events, too: On Dec. 6, storyteller Michele Belluomini will present “Exploring Foodways: Stories Behind the Artifacts,” and on Oct. 4 and Nov. 1, Maya scholar and chocolate fanatic Elin Danien will lead “Delicious—and Good for You!” tours. With the museum’s permission, here are three recipes we found in the book that are perfect for a cool fall day. Referred to as Doro Wett (with variations on spelling), there are many varieties of this traditional chicken stew. You could begin with a whole chicken and break down the parts, but thighs are most reliable. They cook evenly and remain juicy. Hard-boiled eggs are always added at the end and are a surprising treat when taken with some of the spicy gravy and a bit of rice or lentils. 1. In a large pot over medium low heat, sauté onion and salt in butter until golden. 2. Add cardamom, pepper, cloves, garlic, ginger, and chili powder. Cook over low heat, stirring constantly for about 5 minutes. 3. Add stock and chicken thighs. Bring to a simmer and cook, partially covered, for 30 minutes. 4. Add lemon juice and hardboiled eggs. Bring to a boil. Reduce to simmer and cook, uncovered, 5 minutes. 5. Place brown rice or stewed lentils on a serving platter. Arrange chicken pieces on top. 6. Slice eggs in half lengthwise and arrange among chicken pieces. 7. Drench with sauce and serve. 2. Cut squash in half, lengthwise, and remove seeds. 3. Mix syrup, butter, black walnuts, and salt to form a paste. 4. Place squash in baking dish and place a dollop of maple paste in each. 5. Bake 45 minutes or until lightly browned and fork tender. This lovely preparation highlights the natural sweetness of fresh carrots. They play beautifully against the fruity brine of Kalamata olives. Dark meaty Kalamatas, named for their place of origin in the southern Peloponnese, are one of the most versatile varieties of Greek olives. 1. Combine carrots, honey, butter, and broth in a medium saucepan. 2. Bring to a boil, reduce to a simmer, and partially cover. 3. Simmer over medium heat until carrots are tender and most of the liquid has evaporated, about 20 minutes. 4. Uncover and add olives. Cook about 1-2 minutes, just until olives are heated through. 5. Transfer to a serving dish and garnish with dill and fresh ground pepper. The cookbook is available for $27 plus $5 shipping. To purchase, call the Women’s Committee office at (215) 898-9202; email Ardeth Anderson; or download and and submit this form.